Peter Godwin Van Winkle was a United States Senator from West Virginia. Born in New York City, he completed preparatory studies, studied law, and was admitted to the bar, commencing practice in Parkersburg, Virginia in 1835. He was president of the town board of trustees from 1844 to 1850 and was a member of the Virginia State constitutional convention in 1850. He was treasurer and later president of the Northwestern Virginia Railroad Co. in 1852 and a member of the Wheeling reorganization convention in 1861. He was a delegate to the State convention which framed the constitution of West Virginia and a member of the West Virginia House of Delegates in 1863. Upon the admission of West Virginia as a State into the Union, he was elected as a Unionist to the U.S. Senate and served from August 4, 1863, to March 4, 1869. 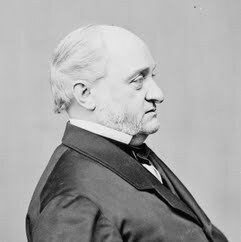 While in the Senate, he was chairman of the Committee on Pensions. During President Andrew Johnson's impeachment trial, Van Winkle broke party ranks, along with six other Republican senators and voted for acquittal. These seven Republican senators were disturbed by how the proceedings had been manipulated in order to give a one-sided presentation of the evidence.